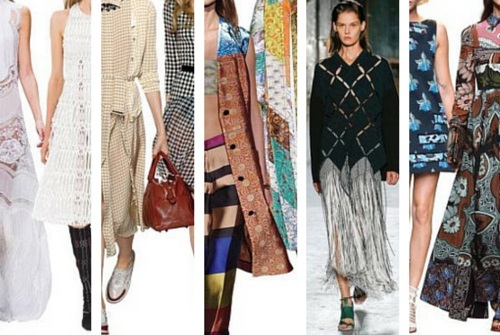 Use my round-up of the main trends for this spring and summer to keep your look current. There's no need to adopt a look 'wholesale'. Be selective. Choose what works for your appearance, lifestyle and personality. 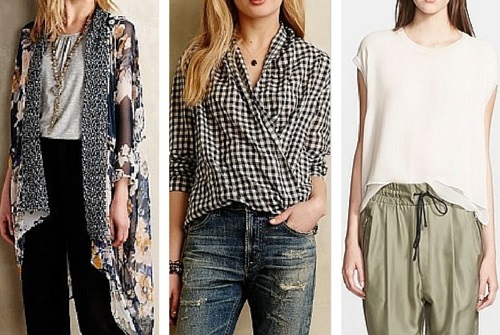 The trends towards a wide variety of styles, colors and shapes continues -- really! (The choice in styles and colors is massive, making it challenging writing this article!). This is great news as long as you know what suits you. If you don't know it really is worthwile investing effort, time and money to find out! 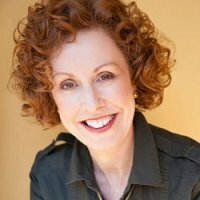 If you'd like my help contact me. One of the main spring/summer fashion trends is towards larger silhouettes: longer lengths in pants, skirts and dresses; wider widths in tops, and bottoms. An emphasis on layers also continues. This is great for cooler climates and to cover less firm body parts! However, layers don't really work in hotter climates, except to go between air conditioning and the elements. Luckily there are plenty of other choices available! 1970s-inspired styles. This includes: Bohemian soft loose, flowing pants, tops and dresses; flared trousers; texture such as suede, fringing, and 'nubby' fabrics; natural fibres; wide-brimmed floppy hats; practical cross-body bags; denim everything (jeans, skirts, dresses, shirts); handmade clothing and accessories; ethnic jewellery; warm colors such as mustards and olives; clear, bright acid colors; Birkenstocks and flat sandals and shoes; platforms, wedges and block heels; sloganed clothing and so on. Monotone colors -- wearing shades of one color such as blues, or greys, or whites (or any other color). This look can be very elegant. The trick to getting it right are making sure there's enough contrast between the color you pick and your face (skin, hair and eyes). Use different fabrics and textures to create more interest. In line with the emphasis on larger silhouettes and layering, the range of styles in skirts, pants and tops continues to improve. 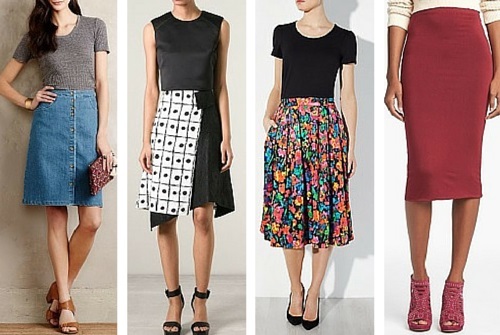 Images courtesy: Nordstrom, FarfetchCulottes: Skirt or Pants? 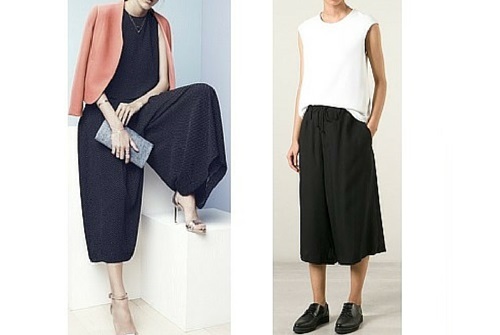 Culottes started to appear as a very minor trend in the last year or so. They're back more prominently this year with more choices of lengths and styles. I'm never sure whether to classify these as skirts or pants! If you're going to experiment with this style take care that you don't make your legs 'disappear'! 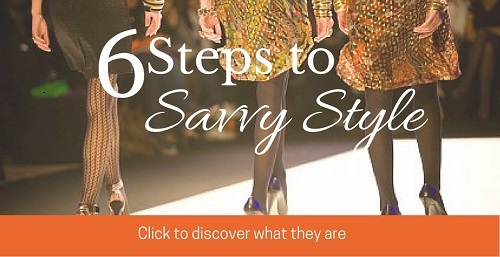 There's pretty much any style and length of pants and trousers to choose from this season! 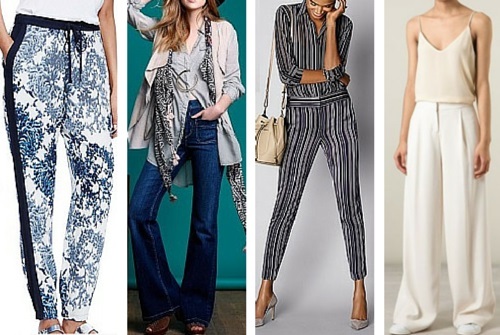 The ones shown above represent just a small sample (and no the striped oufit is not a jumpsuit, though you'd be forgiven for thinking it was!). If you like knee length, fuller shorts you'll find them this year. 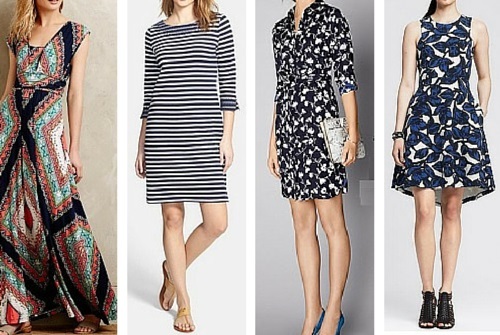 Dress styles include: maxi and midi flowing boho styles; shirt dresses; shift dresses; and fit-n-flare styles. As you can tell from the above images patterns and prints are widely available. As are shades of blue! Inline with the wider choices in skirts and pants there's a greater variety of tops available as well. If you're going to try bigger volume on your bottom half keeping your top half more streamlined will most likely work better for you. There are still mainly styles of jackets available. For example, the kimono-style pictured above, which can be used to dress up an outfit. Light-weight and light-colored trench coats are also on trend. There are both classical and more creative style to choose from. Styling tops tucked in and belts both help to manage the volume. There's a large range on sizes, styles and colors available. The long-strap style is particularly dominant. However, there are also many clutch purses around and totes as well. Bags are a great way to add a pop of color or trendy fringe to an outfit! Belts -- use to give structure to larger shaped clothing. As a minor trend, the obi-style belt is also back. Scarves -- 70s airline hostess neck scarves. I've seen a photo of Iris Apnel wearing this style well! So, you don't need to be young, but you do need a long, slimmish neck. The trend towards mixing prints continues (tricky to get right, but can look really interesting when it's done well!). A new trend is to wear a top and bottom in the same print. When tucked in this will make the outfit look like a jumpsuit or dress.